The 20th Nuclear Plant Chemistry (NPC) International Conference, which started in Bournemouth (UK) and held every other year, was held in Brighton (UK) in October 2016. It is the most im­portant conference related to chemistry in Nuclear Power Plants, and covers many new results in this area. 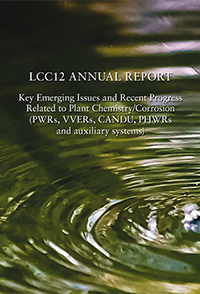 The key information presented at this Conference is covered in two separate LCC12 Reports. This Report does not only covers PWRs, VVERs, CANDUs, PHWRs and auxiliary systems issues but also summarizes and analyses the results to assess in which specific situation the results are applicable and give the point of view of experts of ANT International that atended the Conference. The second report covers BWRs and Fukushima response.